Given the rate at which today’s technology speeds past calendar pages, you probably think that the design for the best binoculars with camera is a fairly new invention. Don’t bet money on that supposition. HistoricCamera.com editors say the very first binocular camera was invented by the London Stereoscopic Company around 1897. The first iteration of that design was meant to serve only one purpose: serving as a box camera. But when inventors changed the shape of the case, voila! A binocular camera was born. At a weight of less than a pound, that first version of the primitive binocular with camera product morphed into two; one shot 7- x 5-inch images, while the second took minis sized 3.5- x 2.5-inches each. Over time, technology has gone from experimental to refined as both camera and binocular engineering grew closer and closer, until the two began to merge, which is why you’ll find these products being produced by companies that run the gamut from Nikon and Bushnell to proprietary products from Sharper Image. Investing in a binocular-camera will take you to brands and names you might never have encountered before, but if you do your homework, you’ll find the one that’s right for you. Perpetually on lists of most-favored camera/binoculars, the CamKing may only have a 2-inch LCD screen, but digital images are high-def, so whether you’re shooting video or photos, you’ll achieve your goal. The 12X magnification-32mm aperture binocular system gets you up close when you need it most, so whether you’re in the surveillance business or taking outdoor images is a priority, the CamKing covers all bases. -Complete control over all functions. 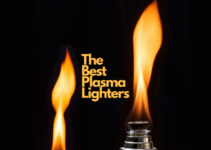 -Adapts to indoor and outdoor use seamlessly. -Protective grey casing is both sturdy and elegant. -Affordably priced at under $90. -You might not find the binoculars user friendly if you wear glasses. -Zoom function is a separate control that must be managed. -You may need a tripod to achieve stability. -May not read your memory card. If you’re not ready for a full-fledged 2-in-1, spend less than $60 to purchase the Gosky Titan that features a Quick Smartphone Holder allowing you to capture photos using the phone as your camera. Waterproof, fog and shockproof, this product is lightweight and compact. These sell out fast, so if you spot one, grab it. -12 X 50 power magnification and O-ring sealed optics rebuff moisture, dust and debris. -50mm wide lens for capturing small details. -Holder fits most smartphones; Rubber Armor Stripes hold tight, even in bad weather. -BAK-4 interior prism and multi-coated lens protection. -Not every smartphone works with this monocular despite Gosky’s claims. -Reports of adaptor breakage during mounting process have prompted returns. -Owners complain it’s impossible to properly line up images. -Despite its small size, this product has been called too cumbersome. If you’re a fan of intrigue—or part of the work you do involves surveilling suspicious people, deer or the perfect landscape shot—you’ll appreciate this full HD digital combo that calls itself the ultimate spy camera. This product folds for storage when you take it on the road so it will perform nicely, whether the wildlife you hope to capture is in the forest or on a concert sound stage. -Achieve clear, crisp photos and footage, even in dark environments. -Features a 12X magnification/32mm aperture system. -Excellent optics plus LCD display that’s easy to learn and responsive. -Not the right product for people with close-set eyes. -Lacks comfortable, protective rubber eye cups. -The quality of the zoom feature may leave something to be desired. -Cheap plastic casing is vulnerable to damage. It’s anybody’s guess why Bekvot promotes this monocular as an adults-only product, but perhaps the price tag, which is under $50, may lead people to believe it’s made for precocious children. It’s not, say those who use it for high-definition tasks that range from hunting to photography, and everything in-between. Waterproof, dustproof and shockproof, even the “twist-up-and-down” eye cup is more comfortable than most. 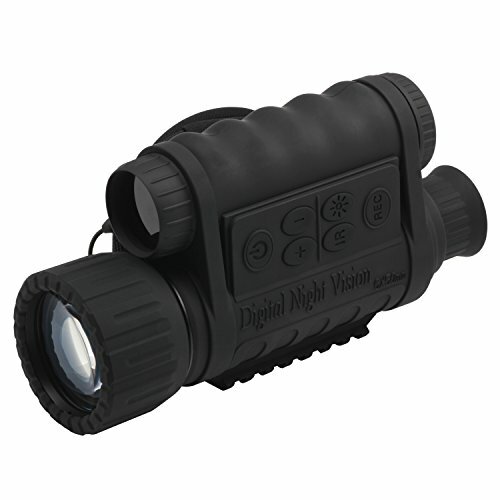 -Premium optics; 10×42 monocular works with either eye to capture images. -Features a BAK-7 prism and multi-layer embedded lenses for efficient light transmission. -Brighter, clearer, true color definition; fitted with a clip for mobile photography. -Center focusing HD zoom lens for effortless single-hand focusing. -The phone holder gets the most complaints from consumers returning this product. -May not be able to balance this monocular comfortably enough to use it regularly. -Due to the design, interface between the camera lens and eye piece may be problematic. -Bring along a roll of electrical tape; you may need it for light blocking. While shopping for your first (or latest) camera binocular combination, you may have noticed that a popular price point is around $90, and this Ansee digital is no exception. The telescope camera gives users a handy 2-inch, pop-up LCD display window to accurately frame shots and the 12×32 5MP video photo recorder stands ready to capture images on the 8GB SD card that comes with this product at no additional charge. 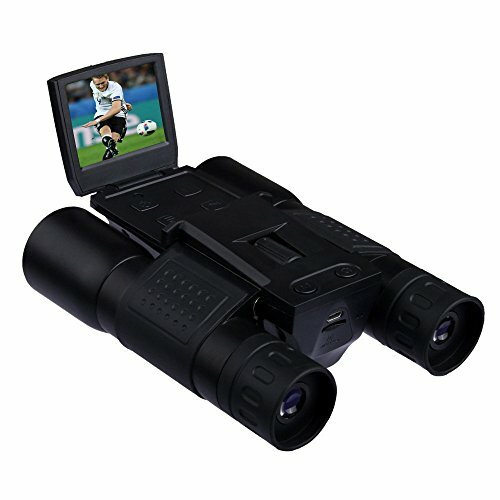 -Highly rated by shoppers for the built-in video camera capable of shooting at 1280 X 1080 resolution. -Comes with a re-chargeable lithium battery. -Accurate, sharp photos from preview screen to video recording, even in dark environments. -Complicated to use if you’re not comfortable with technology. -There may be too many steps to follow if one is to take full advantage of this product. -Surprisingly lightweight, you may require a weightier product for stability. -Won’t work with all Apple products. If you’re ready for the big leagues and don’t mind spending upwards of $350, the Bestgarder NV800 could have your name written all over it. This complicated product does everything but pack your camera bag for you: it’s a night vision hunting tool, camcorder and camera and the scope itself is premium class, so even if you only want to employ the binocular feature, you’ll be impressed. -Built-in 2-inch, 320 x 240-pixel TFT Display screen can be converted to 4-inches. -Shoot photos or video from 1300-feet away, day or night, via the built-in 850NM 3W infrared illuminator. -Superior optical clarity; binocular offers 7X magnification and 2X digital zoom capacity. -Continuous run time of up to 6 hours with IR illuminator; 14 hours without. -Given the sophistication of this system, it’s not designed for newbies. -You only get a one-year warranty with this product. -Operates on 8AA batteries and power bank, neither of which are included. -This binoc/camera/camcorder may be outside your price range. 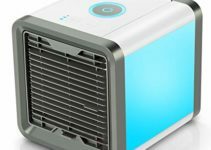 This product promises a lot for less than $80, so consider its merits and downsides before you buy. 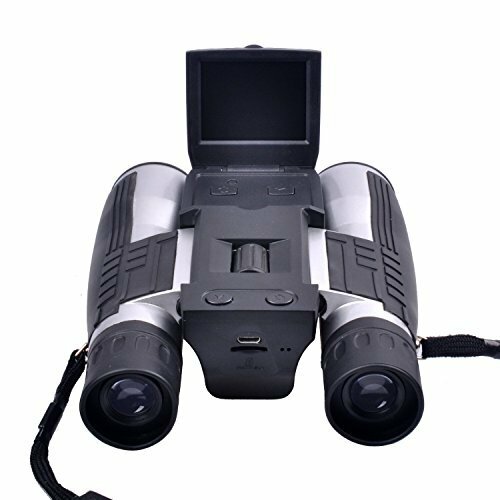 Not as highly rated as others in this price category, it’s still a respectable piece of equipment if all you seek is a pairing of 12-x-32 binoculars interfaced with a built-in digital camera. This piece of equipment comes with enough extras to give it a second look. -Comes complete with a neck strap and carry case for easy transporting. -Rugged exterior construction with non-slip design features. -HD clarity paired with standard-sized binoculars. -Get the creativity of a digital camera without the accompanying price tag. -SD card must be purchased separately. -The focus function is rudimentary and may not satisfy your needs. -Fairly new to the market, not all the bugs have been worked out, say shoppers. -Optics are acceptable but not necessarily the quality you seek. Engineered especially for shooters eager to operate in low light and in the dark, this piece of equipment has a lot going for it at a price of just over $250.The camcorder function snaps 5mp photos and 720p video using the 1-5x digital zoom from a distance of up to 350m. Pair 6X magnification with a 50mm objective lens and you’ll have a respectable piece of equipment to handle any of the assignments or hobbies you pursue. -Infrared illuminator pumps up field of vision to 1150 feet. Turn off IR for daytime color photography. -Video and photo resolution ranges are 2592×1944 pixels; 1600×1200 pixels; 640x480pixels. -Water-resistant housing is compatible with mountable tripod accessory. -Use this as a live infrared surveillance camera by interfacing it with TV or computer via USB cable. -The pop-up screen dimension is only 1.5-inches square and HD resolution is iffy. -If you don’t intend to use this product for nocturnal activities, this could be feature overload. -You may have perpetual focusing issues and the instructional manual may be of no help resolving them. -Record button has been known to freeze and require restarting. 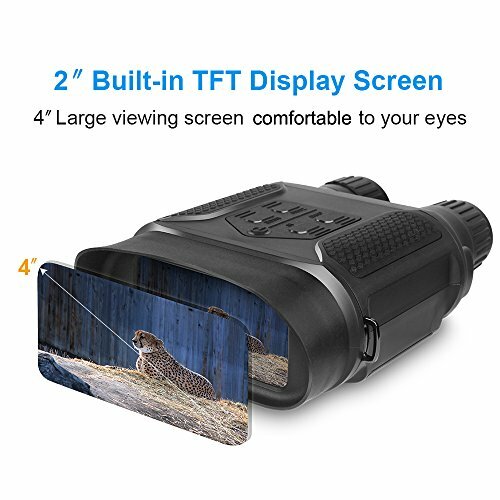 If you like the brand but won’t use a monocular, spend around $100 more to get a traditional, double-sided binocular with advanced camera features. Shoot from 1300 feet away and expect clarity and precision. Take 5mp photos or 640p video. Everything about this model is bigger than life, so as long as you don’t mind making a dent in your plastic, this could be the combo you’ve been lusting after. -Comes with a convex lens that allows shooter to expand 2-inch TFT display screen to 4-inches. 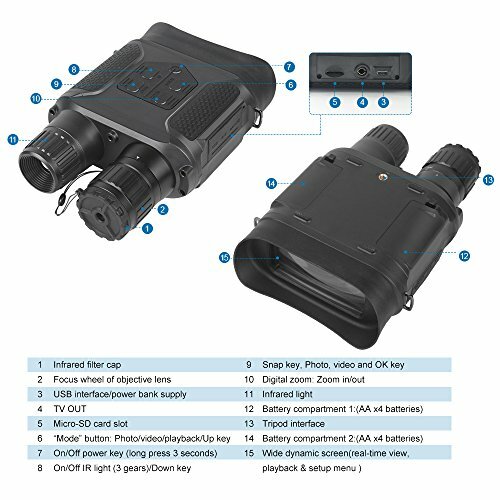 -Professional grade binocular system with built-in 850NM infrared illuminator. -Patented filter for exceptional clarity, you get 7X magnification and a 31mm objective lens. -Excellent data storage and video output features plus date/time stamping capability. -Does not come with the rechargeable battery needed to power this equipment. -As the priciest product on this list, you may not be ready for this much sophistication. 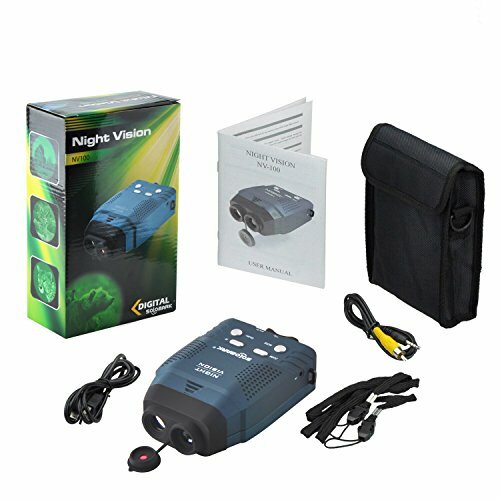 -Products that cost less will give you just as much night vision range and quality. -Owners report repeated problems turning the unit on for no reason. If you wonder why this looks like a spaceship rather than a pair of binocs that happen also to shoot photos and video, you’re not alone. The affordable Solomark gets high marks for design and it’s the only product in this review that features a blue-infrared illuminator that enhances night vision and shooting. 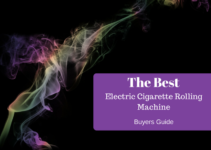 At just under $130, this product attracts an eclectic shopper, so if you love owning cutting-edge equipment, you’ve already got a reason to consider it. -Multi-coated glass; sensor; integrated color LCD screen; 7 level IR LED illuminator. -View up to 328-feet in the dark. -Interfaces with televisions and computers; transfer photos and videos to either. -Comes with a 2-year limited warranty, 4GB micro SD card, USB cable, carry case and neck strap. -Keep it out of the elements; this unit is not waterproof. -Consumers returned this product because it failed to operate properly at night. -Unit’s IR system emits a piercing noise, so wildlife in your sites could vanish fast. -Lens quality could be disappointing if your expectations are too high. Why Binoculars With Camera And Not One Of Each? Let us count the ways. 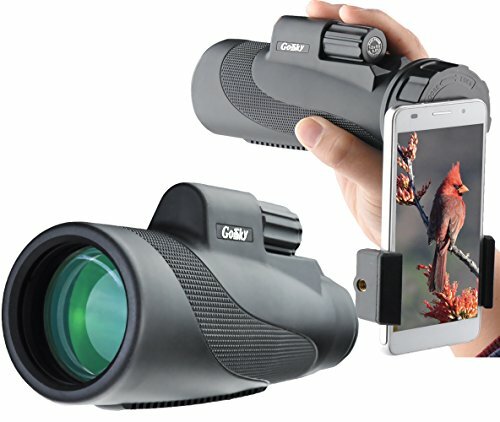 Whether you’re a birdwatcher, a person who loves the idea of capturing images one can’t get when the subject is too close, or you’re the economical sort who loves the efficiency of products doing double duty, owning one of these clever tools offers benefits you won’t discover until one’s in your possession. As you can tell, you have a choice of price points, but keep this in mind: it’s never good idea to invest in cheap optics! 1. Did I read reviews and talk with experts on the topic to make sure I’m getting what I want? 2. Is my vision good enough to work with a display that’s only 2-inches square or do I need a larger view? 3. Do I have specific parameters that must be met in terms of zoom, pixels and resolution? 4. Do I want a product that does it all or just binoculars designed to interface my smartphone? 5. Can I assess image quality specifications before making a decision? 6. Am I only comfortable buying a well-known brand or am I more concerned with the quality of the optics? 7. Will I only consider binoculars with video/photo capability, or will a monocular do what I need, too? 8. Am I willing to learn new ways to hold and position these products to be fully skilled? 9. Does this purchase represent a need for a professional-grade product or am I still learning? 10. Can I get the longest warranty possible, so I can return the product if it doesn’t suit my needs? Why You Must Manage Your Expectations! -Expect to put up with short battery life; this equipment tends to drain batteries fast, even when turned off. -Photos won’t be competition worthy; focusing issues tend to plague these products. -Even binoculars sold as lightweight and portable may be bulky and cumbersome. -Be prepared to use a tripod to improve the quality of your images and video. -Every time two products become one, compromises are made. Keep that in mind. Should You Invest In The Best Binoculars With Camera Now Or Wait? 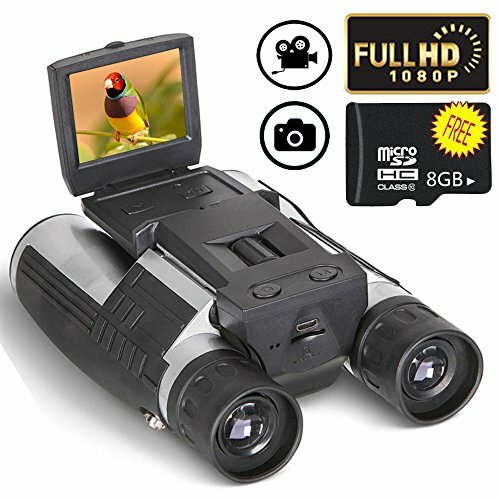 According to the folks at Birdwatching.com, we’re just beginning to enjoy the wonders of technology that pairs binoculars with cameras. Ultimately, optical viewing will become a thing of the past as high-res displays get sharper, clearer and show off more detail. Zooms are going to zoom like never before and even the process of analyzing framing before you shoot is likely to advance. Driven by more sophisticated sensors, the potential for shorter exposure time and even working with larger pixels will dominate this combination optics tool, so it’s incumbent upon you to keep an eye on new innovations coming from engineers at companies that make both types of products. Seeking nirvana today? How about digital recording binoculars made by Sony that sell for $2,000? They’re extremely hard to find; even your favorite online resources may not stock it. But you can dream, right?